These super rich and totally indulgent chocolate coconut cupcakes are filled with coconut cream, topped with thick coconut buttercream and finished off with a hearty sprinkle of toasted coconut! These are sure to be any coconut lovers new best friend! Greetings from sunny California! As you probably have noticed by now, I’m on vacation. I flew out of NYC last Thursday, and have been a busy little bee out here on the West Coast. Updates coming soon – promise! Until then… I made you cupcakes! These cupcakes are a coconut lovers dream! Every element of these cupcakes involves coconut, but don’t worry – it’s not overwhelming! Chocolate and coconut are a great flavor team, and really balance each other out. 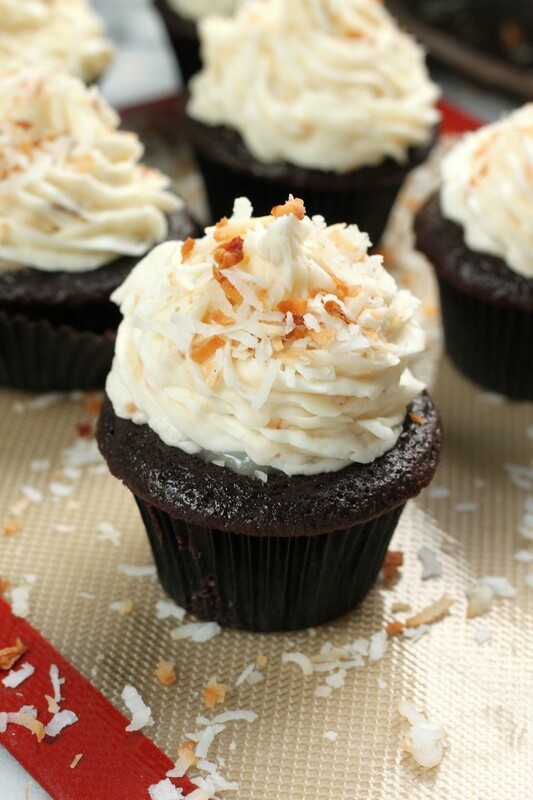 The base of this swoon worthy coconut treat is an insanely moist chocolate cupcake. The cupcake is made with coconut oil, ensuring a light coconut flavor, and a perfectly tender crumb. Exactly what we want! Exactly what we need! Now for the filling! Creamy, sweet, and full of coconut flavor – it’s the perfect thing to stuff in the center of these cupcakes. Once you’ve made – and cooled – your filling, all you’ll need to do is cut a little hole in the center of your cooled cupcakes and fill away! The final step in our cupcake adventure is the buttercream! This buttercream is made with coconut milk and shredded coconut, and is the perfect final touch to these dreamy cupcakes. I like my buttercream very thick, so in the recipe I recommend starting with a small amount of milk, but you can always add more if you like. To make things pretty I topped each chocolate coconut cupcake with toasted coconut, and highly recommend you do to 🙂 It looks good and tastes great! Place cupcake liners in muffin tin. Spray lightly with PAM cooking spray. *The cooking spray really helps the cupcakes not stick to the liners. Preheat the oven to 350 degrees (F). Line a 12-cup cupcake/muffin tin with cupcake liners and lightly spray the liners with non-stick spray (optional but it does help them peel right off). Melt the oil, butter,and chocolate together in the microwave, heating in 30 second increments, and stirring between increments each time. You can also melt the oil, butter, and chocolate over very low heat on the stove top, but I find the microwave to be much easier. Whisk mixture until completely smooth and set aside to cool. In a large bowl, whisk together the eggs, yolk, sugar and vanilla together; beat until smooth. Add the cooled oil/butter/chocolate mixture and whisk until smooth. Add half of the flour mixture, then half of the sour cream. Repeat the process until everything is added, and be sure to mix until JUST combined - then quickly stir in the hot coffee/water. It's important not to over mix, here! Just stir until evenly combined. Divide the batter among the 12 liners in your prepared pan. Bake for 16-18 minutes, or until a toothpick inserted in the center comes out clean. Cool completely before frosting. In a small, deep heavy-bottom pot heat the heavy cream, sugar, and butter over medium-high until the sugar has completely melted; whisk well to combine. Whisk the cornstarch and vanilla into the cream mixture and bring to a boil. Continue cooking the mixture until thick, about 1 minute. Remove from the heat and stir in the coconut. Let the mixture cool completely before using. Beat butter with an electric mixer in a large bowl until smooth; add vanilla extract. Gradually add confectioners sugar to butter, beating until well blended. Don't worry if it looks dry! Add milk into butter mixture and beat until smooth. Fold half the coconut into the icing. Sprinkle remaining coconut over cupcakes. Once cupcakes are cooled, cut a small hole in the center of each cupcake. Place a tablespoon of filling in the center of each cupcake, then top with buttercream. Top each cupcake with toasted or untoasted coconut, and serve! Ooh I love coconut! These look sensational. Gorgeous cupcakes, m’lady! I adore coconut and chocolate together and won’t dispute you that these are “the best”. With ingredients like this, they look like the best ever! I find that the best desserts involve coconut and chocolate. These look KILLER! Oh these have my mamas name written all over them. She loves coconut! These cupcakes really look fantastic! The filling sounds very nice.. These look amazing! 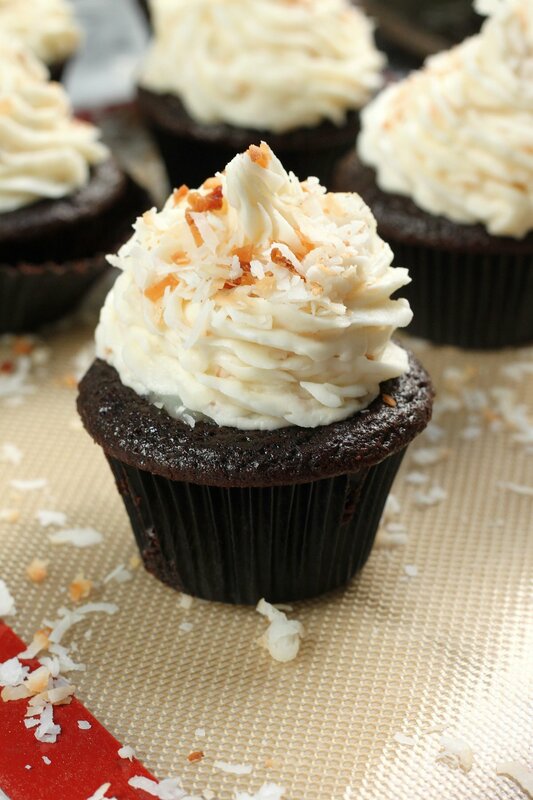 Those chocolate cupcakes look so sticky and decadent and you can’t beat the chocolate/coconut combo! I love you for these. Seriously, yum! Pinned. Holy cow coconut! I’m head over heel for a-n-y-t-h-y-i-n-g coconut but stuff it in a chocolate cupcake and top it with more coconut, and I’m seriously in love. Loving all the Instagram posts of your trip!! Gorgeous cupcakes, love the coconut buttercream! I AM SOOOO JEALOUS that you went to Cali!!! and that you got to make and eat these clearly amazeballs cupcakes! The chocolate cake base looks so chocolatey and decadent and then ALL that coconutty yumminess! hooray! These look yummy!!! How many regular sized cupcakes does this recipe yield?? These cupcakes turned soupy after adding the hot water and exploded all over my oven. Not good! Hi Linday. I’m so sorry your cupcakes didn’t come out. All of my chocolate cupcake recipes call for hot water and I’ve never had this issue. Please email me directly if you’d like to troubleshoot what went wrong! How would you recommend converting this into a cake? The chocolate cupcake is rich and delicious…so moist. I would note that the coconut cream makes twice as much as you need to fill the cupcakes, so next time, I will cut the recipe in half. OMG! These must be utterly delicious! I am making cupcakes for a family reunion. Love this recipe but can these be frozen? How much is one stick of butter? I live in Newfoundland, Canada and we don’t have “sticks” of butter – just one-pound blocks. I really want to try these cupcakes. They look delicious! Hi Leanne. One stick of butter is 4 ounces. Do you use liquid coconut milk or the thick coconut milk (like cream) that comes in a can? What tip is best for piping this icing ? It’s so thick I’m having issues. What can I use instead of the sour cream/cream? Does this recipe really only make 12 cupcakes? It seems like a lot of ingredients for only 12. I’m hoping it makes 24 and I can just double it for my event. Thanks!